Carol Folt will step down as chancellor of UNC-Chapel Hill, UNC announced late Monday afternoon. Her tenure will end after this year’s graduation. 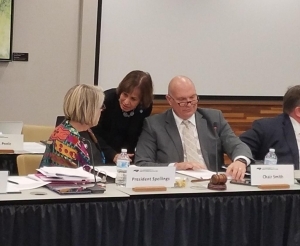 UNC President Margaret Spellings, UNC-Chapel Hill Chancellor Carol Folt and UNC Board of Governors Chairman Harry Smith huddle before a tense meeting of the Board of Governors in December. In a message to the university community, Folt announced her decision, highlighted some of her accomplishments and acknowledged challenges still facing the UNC community. Among the challenges – her disagreement with the UNC Board of Governors about whether the “Silent Sam” Confederate monument – toppled by protesters last year – should return to campus. Folt, who has been Chancellor since 2013, has been a frequent target of some of the more conservative members of the Board of Governors. They have criticized her actions surrounding the Silent Sam monument, protests related to the issue and for not taking stronger action against students, faculty and staff engaged in protests around that issue and others with which she has disagreements with the board. At the same time, Folt has been a frequent target of those in the community who feel she has not done enough to oppose the board of governors’ attempts to pull the campus and the university system to the political right. In the message Folt said she has ordered the removal of the pedestal on which the monument stood at McCorkle Place in the center of campus. In a statement late Monday, several members of the UNC Board of Trustees said it supported her decision to remove the statue’s base in a release that seemed to frame her resignation as directly related to the statue. The message was signed Charles “Chuck” Duckett, vice chair; Julia Grumbles, secretary and Lowry Caudill, current trustee and past chair. UNC Board of Governors Chairman Harry Smith issued his own statement Monday night. He also criticized her order to have the Confederate monument’s base removed. “In December, the Board developed and articulated a clear process and timeline for determining the best course of action for the future of the Monument—and this remains unchanged,” Smith said. Early Tuesday, Gov. Roy Cooper issued a statement supporting Folt’s decision on removing the statue’s base. Folt’s announcement comes after UNC President Margaret Spellings’ own resignation, announced in October. Spellings, like Folt, has had a series of tensions with the UNC Board of Governors. At the start of this semester and new year, I see possibility and promise and am filled with the sense of the limitless potential that makes Carolina such a vital place. In that spirit, I would like to share two important announcements with you. First, you’ve heard me say many times that it is the privilege of my life to serve as chancellor of this great university. I’m deeply proud of what you’ve accomplished and what we’ve accomplished together since I became a Tar Heel nearly six years ago in 2013. I am writing today to let you know that I have decided to step down as chancellor following graduation, at the end of the academic year. There is much I intend to accomplish with you in the next few months. I will continue to focus on our core mission, do all I can to make sure every person on our campus can thrive and feel welcome, and push forward with Carolina’s campaign and history task force. There has been too much recent disruption due to the monument controversy. Carolina’s leadership needs to return its full attention to helping our University achieve its vision and to live its values. And I want this semester to be exciting and fulfilling for every one of our soon-to-be graduates. Most importantly, we must always do what we can to make sure our faculty, students and staff have a creative, innovative work and living environment, one that is inclusive, forward-looking and safe. This year for example, we reached our highest level of research funding ever (5th in the nation in federal funds), continued to see historic increases in first-year applications and levels of philanthropy, and pushed ahead as a national leader in affordability, access and student graduation rates. These accomplishments show how talented and dedicated our community is and what can be achieved even in the face of disruption. Just imagine what is possible if we can put our full attention to the potentials and needs of the future. Second, I have authorized the removal of the base and commemorative plaques from the Confederate Monument site in McCorkle Place. As chancellor, the safety of the UNC-Chapel Hill community is my clear, unequivocal and non-negotiable responsibility. The presence of the remaining parts of the monument on campus poses a continuing threat both to the personal safety and well-being of our community and to our ability to provide a stable, productive educational environment. No one learns at their best when they feel unsafe. The independent panel of safety experts we convened in November to help us review options for the monument that we presented to the UNC Board of Governors made a strong and compelling case for risks to public safety. The fact that despite our best efforts even since then, threats have continued to grow and place our community at serious risk has led me to authorize this action. As I have said before, safety concerns alone should preclude the monument from returning to campus. This was also the strong preference of the UNC-Chapel Hill Board of Trustees. The base and tablets will be preserved until their future is decided. While I recognize that some may not agree with my decision to remove the base and tablets now, I am confident this is the right one for our community – one that will promote public safety, enable us to begin the healing process and renew our focus on our great mission. As we celebrate Carolina’s 225th year, we are poised for a strong future. Supported by citizens of our state, generations of dedicated faculty, students, staff, donors and alumni, we are accomplishing great things for the state and the nation. Carolina is better positioned than ever to be the “university of and for the people.” I believe Carolina’s next chancellor will be well placed to build on our momentum. And with your help and energy we will make this another semester filled with Tar Heel energy, creativity and action.